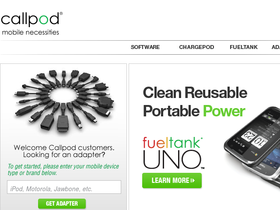 Callpod, online at callpod.com, offers a selection of must-have items for your mobile device. Callpod carries portable charging stations, multi-device chargers, and a large selection of power adapters. What makes Callpod so special is the fact that it carries adapters and products compatible with over 3,000 mobile devices, including smart phones, cell phones, mp3 players, digital cameras, PDAs, navigation units, gaming devices, Bluetooth headsets, and more. Callpod offers perfect products for travel and home. But before you shop, get all the latest callpod.com discounts, Callpod promotions, and Callpod coupon codes found here at RetailSteal.com. Save 50% on all power products from Callpod using this coupon code. Click here to shop. Save 30% on your purchase of power products from Callpod. Click to shop and use coupon code to save. Enjoy 25% savings on your purchase from Callpod.com using this coupon code. Click to shop and save. Shop Callpod.com and save 15% off your purchase site-wide with coupon code. Save on all your mobil necessities at Callpod. Save 20% at Callpod using this coupon code. Click here to shop and save. Save 50% on Keeper Backup using this code at Callpod. Click link to shop and save. Receive a free adapter with your purchase of a chargepod from Callpod. Click link to shop and save today. Charge up to 6 devices at once with the Chargepod, now only $39.95 at Callpod.com. Click link to shop. Fuel Tank Duo charges 2 devices at once anywhere and anytime. Get one today for only $69.95. Click link to shop.